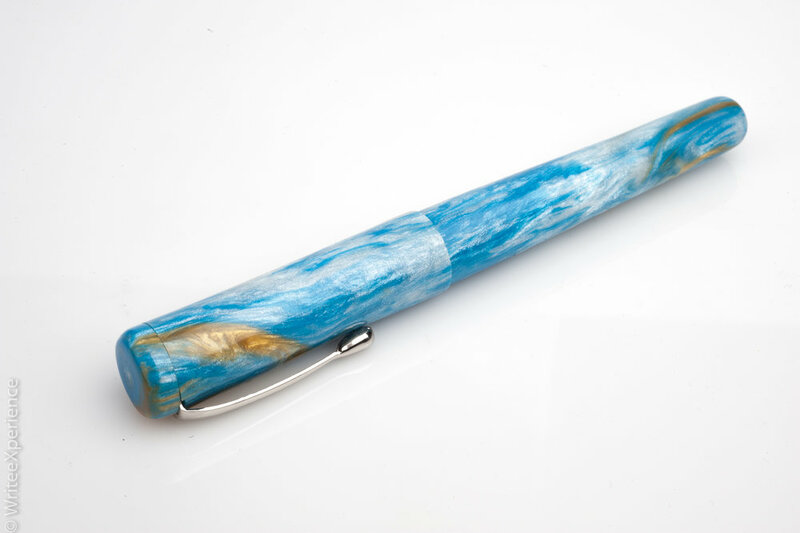 I hadn’t heard of Hinze Pen Company before I saw an image of their Empyrean pen for sale. The seller had purchased it at a Pen Show and was feeling buyers remorse. I loved the colours and design and decided to take a chance on the pen. In person, this pen is even more beautiful than the pictures I saw, as the resin has a shiny luminescent finish and sparkles in the light. This pen is fitted with a Jowo No. 6 sized nib in a 1.1mm stub grind. For even more fun this nib is finished in blue lacquer. It writes really well. The design is a typical flat-top-shaped pen, tapering slightly down the body, and featuring a threaded cap. 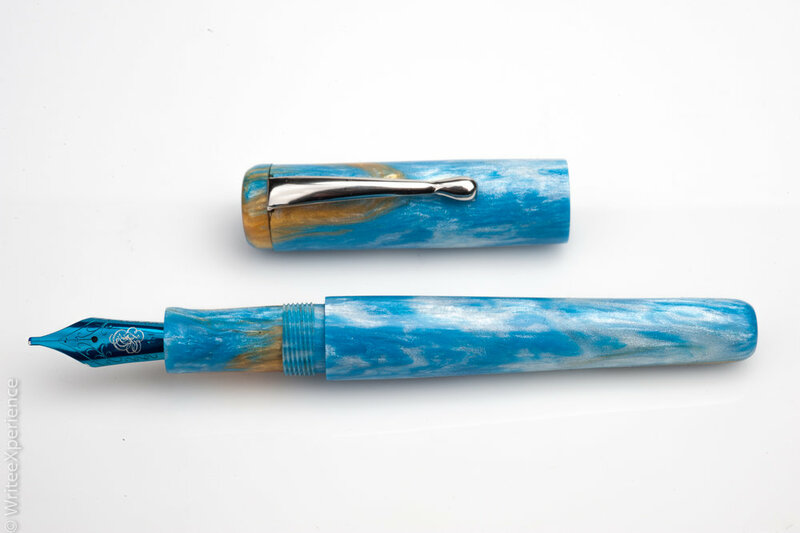 All of the pen, including the section, is turned out of a matching resin material. The cap finial is a matching resin piece that screws onto the cap to secure a silver clip. There is a steep step from the section to the body, but the length of the No. 6 nib and grip section allows me to comfortably write with the pen without having this dig into my fingers. The pen is long enough to write unposted, though the cap can post. I feel that posting makes the pen too long and unwieldy, and rear-weighted. The beautiful resin is mainly blue with white/silver and sand coloured swirls. The swirl patterns look like clouds over a beach, especially with the pearlescent finish. I feel like I am looking down through space at a tropical beach when I look at this pen, which makes me happy. The cap threads onto the body and features a silver clip. The cap button holds the clip in place. On my pen, this is not completely flush, but is acceptable for me, as I would rather not damage the pen by trying to adjust it. There is no cap liner, but the nib seems to stay wet when closed and doesn’t dry up quickly. The nib choice on my pen is an option, based on the selection criteria on Hinze’s website. My nib is a number 6 sized Jowo nib, coated in a blue finish. I was a little skeptical of the nib before I saw it, as I wondered if it would be a little too garish for my taste, but it looks good in person. The nib colour is a brighter and darker blue than the resin of the pen but it still nice. I have noticed that the coating is not particularly durable - the colour coat on the tips of the tines has already worn away and there is a small chip on one of the shoulders. The blue nib is a steel 1.1mm stub and writes well - as one would expect from a Jowo nib. The ink flow is wet and doesn’t dry too quickly in the pen when uncapped. I like the decorative detail that seems to be a stylized H engraved into the blue of the nib, allowing the silver steel nib material to show through. The nib needed no adjustment at all. A disappointing find was that the pen did not come with a converter. (Edit: Hinze Pens reached out to me directly after I posted the review and pointed out that their pens DO come with a converter and offered to send me one immediately - really great customer service!). Luckily, the pen fits a standard international cartridge and borrowing a converter from another pen shouldn’t be too difficult for anyone (and may finally give us a use for all of those Jinhao pens purchased from Amazon!). At this price point, I think it should have been included, but as even some large players like Lamy and Platinum don’t include a converter, I guess Hinze is forgiven. The body takes ten and a half full turns to screw onto the section, so it is pretty apparent that this pen is meant to be eye-droppered. I haven’t tried it, but given the tightness of the body attachment, I doubt that there will be any problems, even given the lack of an o-ring to control leakage. I really like the Hinze fountain pen. With its classic design and beautiful resin, it makes for a great conversation piece and is an attractive pen to photograph. The writing experience is precisely as you would expect from a Jowo steel nib, right out of the box. I was not familiar with Hinze Pens before purchasing this pen and would consider another pen from their selection of exciting and pretty resins for my collection in the future. If you are looking for an affordable custom made pen, I would recommend considering the Hinze designs.